Clownfish sea anemones usually live solitary lives. On many coral reefs there will normally be only one individual for each 50 to 100 meters, perhaps 10 to 20 meters of reef. But occasionally groups of up to several hundreds of clownfish sea anemones are found together within a small area in an assemblage we call anemone cities. One is at Ras Muhammad close to the popular dive resort Sharm el Sheikh where it is but one of the many popular dive sites in the area and well visited by many divers being completely oblivious to the fact that they are diving on a rather unique and fragile structure. They are also found in some parts of Southern Japan, in the eastern area of the Pacific and certain parts of the Indian Ocean. Perhaps the largest tropical sea anemone assemblage in the world covering about 2 km2 of sea bottom lives in central Indonesia. This anemone city was recently described by the renowned German underwater photographer Helmut Debelius in his Asian underwater guide. Anemone cities are not well understood, but clearly something very different goes on here. Little is known about the structure and distribution of these dense sea anemone assemblages and what kind of impact the unusually high concentration of host anemones have on the local ecology—especially the settlement, reproduction and behavior of the symbiotic fishes and crustaceans. Most research studies have, so far, only studied the biology of solitary host sea anemones simply because the necessary resources, manpower and funding are still not readily available in coral reef research. This is rather unfortunate as unusually large “super-structures” in nature, such as the anemone city at Ras Mohammed at the tip of Sinai peninsula, may provide us with a much better understanding of both fish and sea anemone biology. The point is that whatever regulates or limits the abundance of a species and their reproductive success is highly related to the extent of its microhabitat. In this case, the microhabitat for a clownfish is its host anemone and the few meters of coral reef surrounding the sea anemone. Usually a single anemone. So, when nature comes up with an unusual super-structure such as an anemone city, all the usual dynamics and relationships between the organisms in the microhabitat are bound to change drastically. New and more complex interactions arise between the surroundings, the fish, the crustaceans and the anemone hosts, and we see marked changes in physiological and behavioral patterns. These characteristic can be quite obvious to the observant visiting diver. Exactly which patterns, how, when and why this complexity and infrastructure is put together is something we know practically nothing about. This gives cause for great concern as these rare structures are at great risk of disappearing in front of our very eyes due to heavy loads of ignorant visiting scuba divers. The popular Aqaba anemone city assemblage of the magnificent sea anemones (Heteractis magnifica) is, for example, found at the southernmost point of the Sinai Peninsula, northern Red Sea. It is situated on a reef approximately 150 meters east of the popular Shark and Yolanda Reef. At present, about 20-30 large diveboats with up to 300 divers and 1500 snorkellers visit this magnificent superstructure every day. Most of these visitors have absolutely no education in proper behavior on coral reefs. More precisely, anemone city is situated on an underwater plateau of approximately 100 x 75 meters stretching down to an approximate 20-meter depth. It begins at a depth of about 2 meters beneath a short vertical coral wall from there it drops down to 7-9 meters at an angle of 30-45º. From this depth to approximately 20 meters, the plateau is relatively horizontal, sloping only 5-15º. At approximately 20 meters, it ends in a rather sharply defined drop-off which plunges to a depth of about 800 meters. This is clearly not the place to drop your camera. 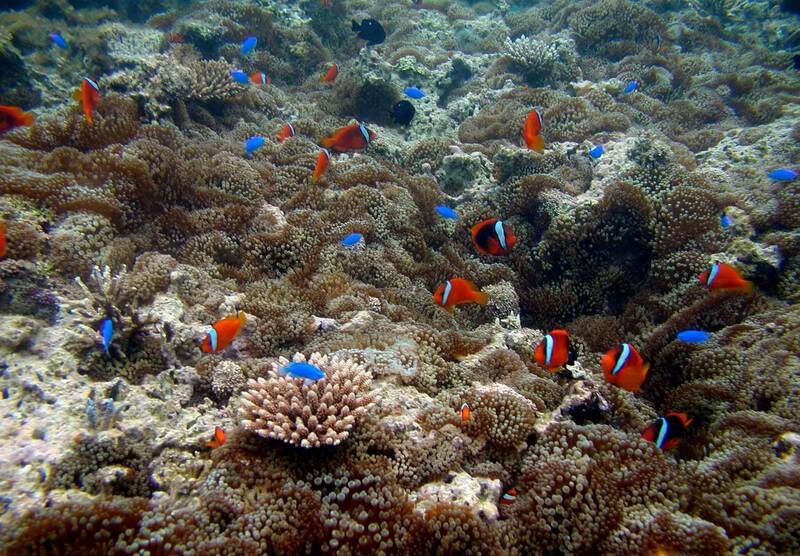 A total of 190 large clownfish sea anemones were counted here. Some were solitary, and some were clusters of presumably clonal morphs (offspring produced from “buds”). The anemones were distributed from a depth of 3 meters down to about 40 meters, which is a new record for the species magnificent sea anemone.